The University of Zambia – University College London Medical School (UNZA-UCLMS) Research & Training Programme was founded in 1994 as an African-led south-north medical research and development organization based at the University of Zambia School of Medicine and Zambia’s national referral center, the University Teaching Hospital. 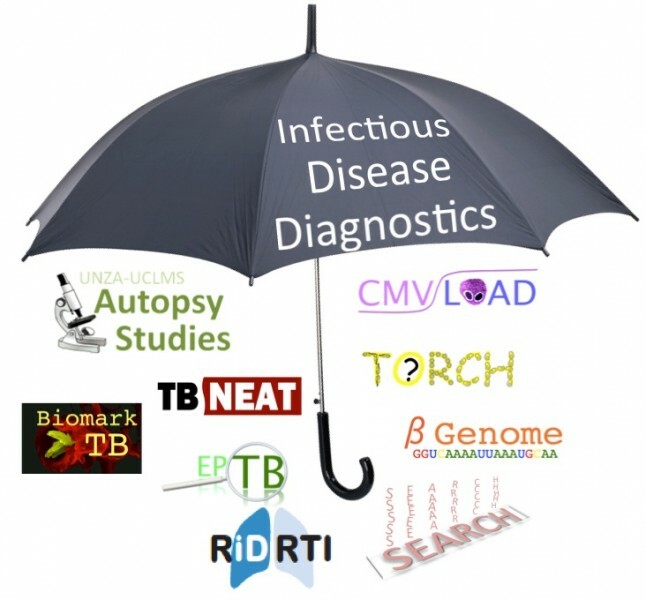 Our research programme is informed by our experiences working at Zambia’s largest referral hospital and we have a range of research projects on topics such as tuberculosis, blood stream infections, antibiotic resistance, and herpesvirus infections, all united under a broad ‘infectious disease diagnostics’ umbrella. We have a strong history of paediatric infectious disease research and our ongoing neonatal work includes studies on prevalence, aetiology and drug resistance with respect sepsis and respiratory infections. We are also interested in congenital cytomegalvirus (CMV) infection in the African context and have recently demonstrated that congenital CMV is extremely common in children born to HIV-infected mothers (Mwaanza et al… 2014). We have paediatric autopsy studies ongoing, the first to be undertaken in sub-Saharan Africa for a decade (since ART and PMTCT roll out). We also have a charitable arm to our operations called “CHANCE“, with the aim of reducing morbidity and mortality among neonatal admissions at our centre through the rational application of philanthropic dontions to increase staffing levels and training, and supprting infection-control activities.